I had a good lie in – in this heat its harder to wake up early, and I've been sleeping lightly, then deeper in the morning. I got the van all packed up, and stocked up with water, full tanks, then headed out onto the road. 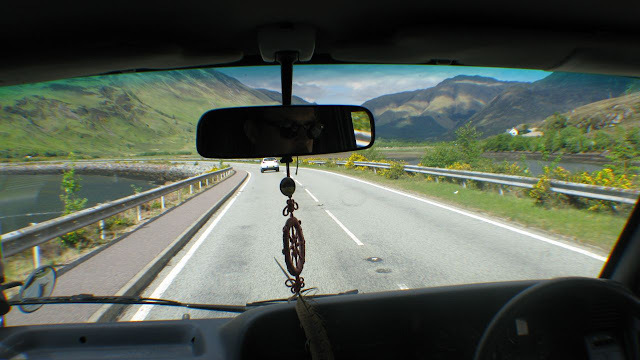 I stopped and filled the fuel tank, got a new propane cylinder, got an extra 20 litre jerry can of diesel, and drove out of Glencoe into the sunshine. I pulled in at Fortwilliam to stock up on groceries for a few days, and found that they had a Lidl, and a Morrisons, and paid both a visit. In Morrisons, the lady was chatting to me about this and that and told me that seven spectators had been killed at the Isle of Man TT – not having heard any news since I left N Ireland it was the first thing I had heard of the outside world. I might go the rest of the trip without hearing the news, and see what is important enough to hear through word of mouth. After having a meat pie for lunch, I drove on out of Fortwilliam, and past Ben Nevis, then began a looong drive which I was really enjoying. Many touring motorbikers were speeding past when they overtook which is an exciting spectacle on the country roads. There were also a lot of road cyclists out today (Sunday) – mostly going in the other direction to me. 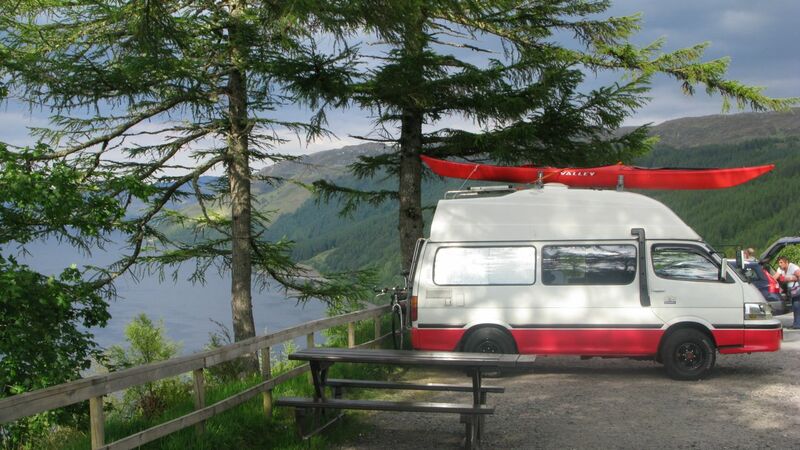 I passed through Invergarry and along by some beautiful lochs, and stopped in a couple of places to look at the views and have a cold drink. The scenery is amazing along the A87, and I when I reached the Five Sisters, and pulled in to the site of the battle of Glen Shiel in 1719. All along this road I was listening to music on the iPod and enjoying the drive through the mountains and passes. Eventually I reached the town of Dornie, and pulled in to have a look around Eilean Donan castle. 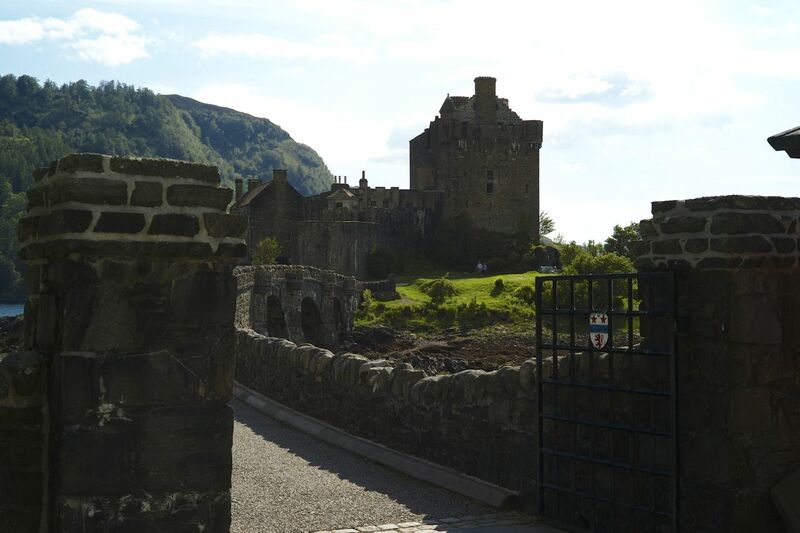 The castle was 'closed' being a sunday evening, but in effect this mean that I could cross the bridge and have a look around the outside of the castle for free. It was great to see around it close up as every time I'd passed this way before I'd only looked on it from the shore. I didn't stay long, even after the long drive – I was keen to get into unknown territory and take the turn off towards Lochcarron. Staying on the A87 brings you to the Skye bridge, and onto the Isle of Skye, which I plan to reach by boat from Harris in a couple of weeks time. As I drove out the road to Lochcarron I really noticed a fall off in traffic, it was sunday evening, but compared to the road to Skye this one was mostly deserted – only the occasional car. After weaving through some forested areas and climbing some steep assents I came out onto an amazing view onto Loch Carron. I had to pull in and spend some time here and have something to eat.. The views from here were amazing – high up above the loch, looking through tall pines onto the sound below. High up enough that all below looked completely still, yet I could actually see the current in the water that hastened the Vikings to call it 'Stroom', their word for strong current. From here it was also possible to see the Kyle line railway tracks far below, and the ruins of a castle on the other shore. I knew I was nearing the first major goal of this trip though, the Applecross Pass, or Pass of the Cattle, on the road to Applecross. So I rounded the loch and made my way toward Loch Kishorn, and the beginning of the narrow ascent. As I pulled up to the beginning of the road, a sign read, 'ROAD NORMALLY IMPASSABLE IN WINTRY CONDITIONS' – I began the winding drive up. All I can say is that this really is a spectacular drive, and well lives up to its reputation, some sections are very steep, and there are scary drops to remind you – the views are also amazing, but its best to stop to look around, as its a narrow single track road (with passing places) all the way up. Nearer the top there are hairpin bends and its even steeper – I was in second gear all the way.. I will not be posting any pictures of the view from the top. You simply have to go there and see for yourself the views over the Isles of Skye, Scalpay, Raasay and Rona, and many other smaller islands. The weather was beautiful, and it was an incredibly calm place, and quiet beyond words.. 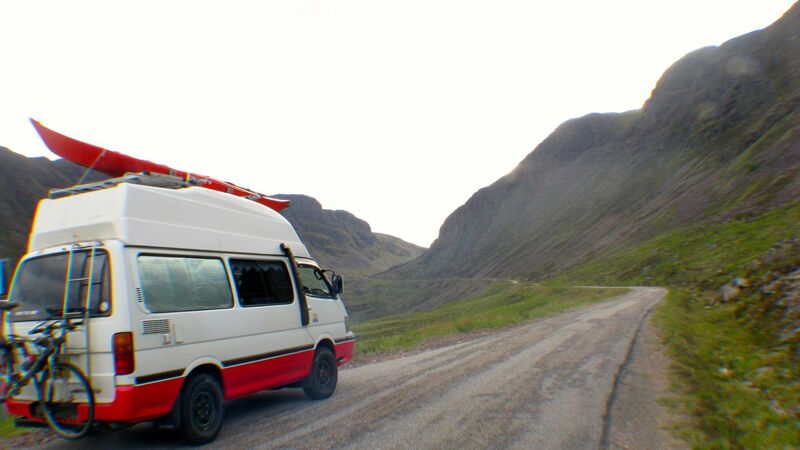 I descended the pass on the other side, pulled into Applecross campsite and booked in for the night – I had experienced enough today, and the Hiace engine needed a rest as much as I did – plenty of time to explore the area around Applecross tomorrow. I set up camp and relaxed looking out to sea, before getting to bed for the night, though it was light until well after 11pm..